March 30, 2018 -- Is breast cancer screening with synthesized 2D digital mammography and digital breast tomosynthesis (DBT) much more expensive than conventional mammography? No, according to Italian researchers who presented their findings at ECR 2018. DBT costs only 20% more, and it detects 40% more cancers. The researchers compared the costs of breast cancer screening in Verona using synthesized 2D digital mammography, which is a reconstructed 2D mammography image taken from DBT slices, plus DBT versus full-field digital mammography (FFDM). They also calculated the cost of FFDM when used in conjunction with DBT as a second level assessment. They found FFDM costs 53.8 euros per person, whereas synthesized 2D plus DBT costs 64.2 euros per person. DBT as a second level costs 66.8 euros per person. "Replacing a mammography screening program with a DBT screening program is feasible with an average additional cost of 20%," said presenter and lead study author Dr. Francesca Caumo from the Senologia Istituto Oncologico Veneto in Padua. "And the DBT screening program shows a significant 40% gain in the cancer detection rate." Screening mammography in Italy is free of charge for women 50 to 69 years old and usually managed on a regional basis, according to Caumo. Introducing new technology in screening needs a cost-effectiveness validation to extend its use at a regional scale. "Economic sustainability is important in a free healthcare system, where equity in the targeted population must be guaranteed," she told AuntMinnieEurope.com. "Scientific assessment of new technologies requires the analysis of their economic impact on the healthcare organizations, besides measurement of clinical benefits." Caumo and her colleagues examined the cost for two consecutive years of breast screening using FFDM (and synthesized 2D + DBT only on second level assessment) from April 2014 to March 2015. They looked at synthesized 2D plus DBT from April 2015 to March 2016. The cost of the entire screening process was calculated by looking at the price tag of each unit as well as the cost of mammograms, workstations, PACS space, staff, and invasive assessment. Costs are summarized in the table below. Using FFDM in 2008, clinicians screened 14,374 women. In 2014, 14,423 needed additional assessment with DBT. In 2015, clinicians screened 16,666 women using DBT plus synthesized 2D mammography. When the researchers divided the cost of personnel with the number of women screened, FFDM cost 43.6 euros per person, using DBT for further assessment cost 54.1 euros, and DBT cost 51.4 euros per person. 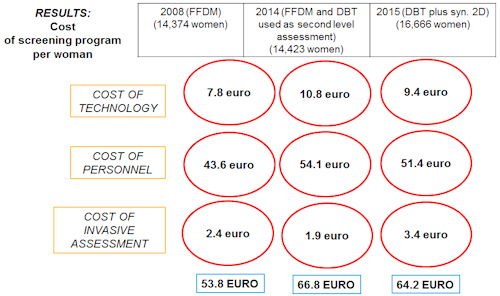 After adding all the costs together for technology, personnel, and invasive assessment, the researchers concluded FFDM costs 53.8 euros per person, DBT for further assessment costs 66.8 euros per person, and DBT costs 64.2 euros per person. A breakdown of the cost of the screening program per woman. Image courtesy of Dr. Francesca Caumo. 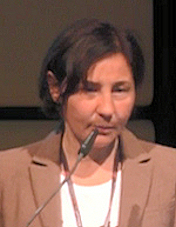 However, other costs are associated with breast cancer screening, said session co-moderator Dr. Sophia Zackrisson, an associate professor and senior lecturer in diagnostic radiology at the department of imaging and functional medicine at Skåne University Hospital Malmö at Lund University in Malmö, Sweden. FFDM detected 6.7 cancers per 1,000 screens, as did DBT when used as a second level assessment. DBT plus synthesized 2D detected 9.3 cancers per 1,000 screens. Other costs, such as those associated with treating cancer, must be taken into account, Zackrisson said. Nonetheless, it's interesting to see the direct costs are not as high as one would expect, she said. Next, Caumo and colleagues intend to include performance analysis of first and second breast cancer screening rounds, characterization of cancer types, analysis of interval cancers, and large cancers. They also plan to start a new pilot study to extend the screening program to women between 45 and 49 years old, with stratified imaging pathways based on individual risk of breast cancer.